I’ve been speaking (utilizing back channels) with the secretive, underground force behind Race to the Bottom Radio. With seemingly hundreds of “for barter” services popping up every week its rare we see a new cash based updating imaging service. Thats not to say most barter services will put a cash amount on their product…but they ain’t gonna be close to this cheap. Like $40 US cheap. Check out this audio to hear more. OR read on to learn more and also there is an opportunity for some free noise! 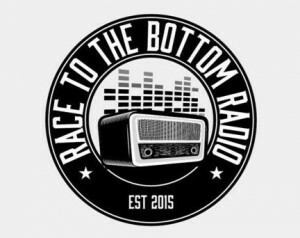 A:Race to the Bottom Radio is built for producers and markets that are on a very strict budget… or podcast, that are looking for some extra audio goodness to help polish the sound of their podcast. Currently, the service is built for use on CHR / Sports stations. If you’re a CHR or Sports imaging producer, you’ll find these work parts and beds very useful. The elements are in your face, and pack quite a punch. Our short form beds make it perfect when placing together short sweeps for the PPM world. We also keep in mind imaging producers that contract out stations on the side. We know, you all love the extra money. Race To The Bottom Radio will allow any free lance producer to use the service on up to 5 stations, for the same cost as advertised on the site. $50.00 CDN (per month). If you want to use it on more stations, no problem. I am sure there’s something that can be worked out. We really wanna help elevate your sound. We don’t demand you give up tons of bater time either. That’s not our style. A: The price per month is only $50.00 (Canadian dollars) per month. I think at the current exchange rate, that works out to be $40.00 (or there abouts) in US dollars. We’ll upload at the beginning of every month, and we’ll never take down what was uploaded from the previous months. So, if you need to find that cool bed that you used a few months ago (but didn’t save it)…no worries. You’ll still be able to access it via the Race To The Bottom Radio on-line library. Q: When is it available and what types of exclusivity or restrictions are there? A:Race to the Bottom Radio is avail’ to use, right away. It’s very simple for us to set up an account, so you can download right away. As of right now, there are no market exclusive rights with this package. However, if a market is looking for exclusive rights, we’re willing to work on getting that, and will take it as a case by case basis. If anyone would like a free preview, you can also hit up the studio with your information: [email protected] – Once you preview the product, and you want to get on board, Race To The Bottom Radio will require a year commitment via contract. A: There’s no doubt, the Production Service industry is a REAL bloody competitive place right now. Insane actually..haha. The long term goals for Race to the Bottom Radio is to keep providing high quality work parts and beds for people that are on a real tight budget, that just don’t wanna give up 100’s per month in cash, or 1000’s of barter dollars per year in barter. In the coming months, we’re hoping to add in both ALT ROCK/Modern Rock elements/beds into the service as well. We expect our growth to be very slow at first. In a world where there’s so much information coming at you, it’s hard to remember everything you see or listen too. We’ll continue to build, reach out via social media and let the work do the talking. We don’t expect major success over night. Patience, quality work parts at an real affordable cost… will be the key to our longevity. Q: Also is there a FREEBIE you can offer my wonderful readers to give them a taste?